Time spent in a recent curatorship class taught by Mathers Museum of World Cultures director Jason Jackson sparked a desire in three IU graduate students to continue their work with a collection of items donated to the university by the late Elinor and Vincent Ostrom. The result? “Ojibwe Public Art, Ostrom Private Lives,” an exhibition on display at the museum now through June 22. It explores works by late 20th-century Ojibwe artists on Canada’s Manitoulin Island, where the Ostroms summered for more than 40 years in a rustic cabin they constructed back in the late 1960s. Third-year doctoral student Sara Clark, from the School of Education’s Department of Educational Leadership and Policy Studies, said she fell in love with the Ostroms’ rich and varied art collection as well as the couple’s personal story. Her favorites among the couple’s collection? 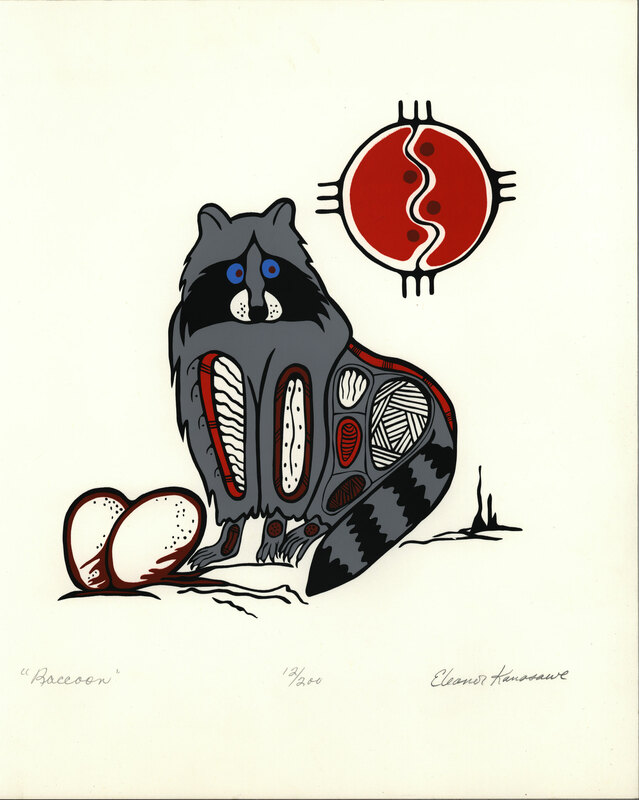 The vibrant animal images created by artist Eleanor Kanasawe, including a porcupine, raccoon, squirrel and other creatures. Graduate student Brian Forist, from the School of Public Health’s Department of Recreation, Parks and Tourism Studies, said he was also drawn to the couple. 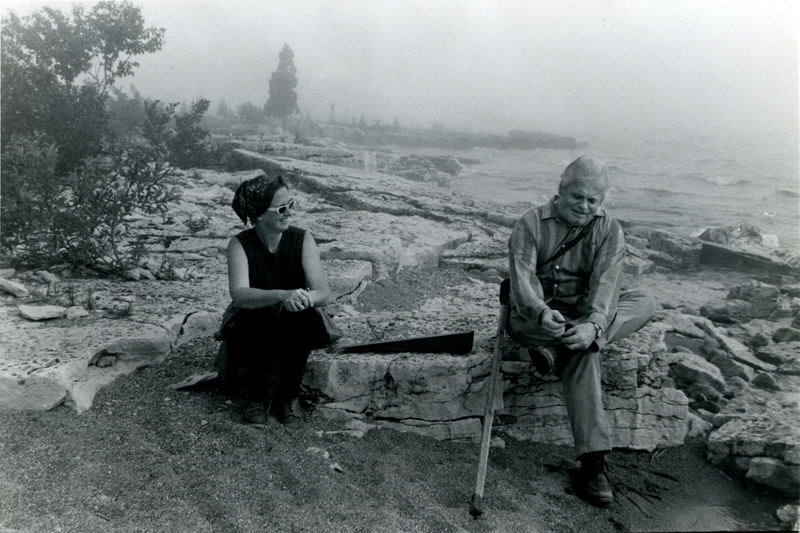 With the help of staffers at the Lilly Library, he was also able to view a series of folders labeled “Manitoulin,” where the couple maintained a similar log-style diary of their activities while staying at their cabin. Nearly every summer from 1967 to 2008, the late Elinor and Vincent Ostrom drove to Manitoulin Island, Canada, to write and build their collection of Ojibwe art. The third graduate student who worked on the project is Dorothy Berry, a dual master’s student in ethnomusicology and library science. Up next, Clark, Forist and Matt Strandmark, a dual master’s student in history and in information and library science, have begun building a digital site for the Ostrom exhibition as well as other Mathers exhibitions. Known to many simply as “Lin,” Elinor Ostrom was Distinguished Professor and the Arthur F. Bentley Professor of Political Science at IU and the only woman to receive the Nobel Prize in Economic Sciences. Both she and her husband, Vincent, the Arthur F. Bentley Professor Emeritus of Political Science, died in June 2012. Following their deaths, university officials learned the couple had donated their entire household to the university. The items were split between the Mathers Museum, the IU Art Museum and the university’s campus-wide collection. The exhibition is partially supported by the IU College of Arts and Sciences’ Ostrom Grants Program, which has also provided funding for related programming.